There’s a YouTube vlogger whose hydrolocked car was a write off because the insurer couldn’t be certain it would not have issues afterwards. I can see why Apple or indeed anyone would give pause as they wouldn’t want to have issues later and be held responsible for not completely “fixing” it. But the cost to repair it is educational. If Linus was prepared to pay for the real repair cost, it may be cheaper to buy a new one. 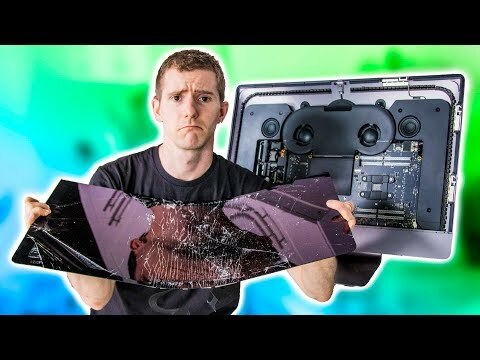 What i found rather funny is that shortly before i'd seen Linus post this video i had been having my morning coffee with a co-worker and for whatever reason i had been telling him about Linus' original video reviewing the IMac Pro (Which obviously lead to it's damage). 1 of the points he made, was that there is no video in. So down the line when you want to upgrade you can't even get extra use out of the machine by using is as a 2nd monitor. This is a rather deliberate choice by Apple to create Forced Obsolescence. It's rather shady and definitely Anti-Consumer. This issue he's now having has the same smell of even more Forced Obsolescence. Huh? So you’re expecting to use a computer forever? The point is Apple couldn't fix it without replacing the entire thing because they don't have the parts. Regardless how you broke your new fancy Mac. Apple would have to replace the entire computer instead of fixing it, in house. Stupid. Well, Linus ruined the whole computer so there’s no point in fixing it. It’s better to just replace the whole thing. On linus’ dime, of course. Wow, this news sure generated a lot of new accounts. Dosent matter if the damage was physically or not the part's should be awailable to be purchased at full retail price with no hassle. Apple knows they are the only ones that produce the parts for this contraption and that they can do whatever they want, but if I am not mistaken this is how Apple excerpt control over their hardware. Bad practice shame on you. As for Linus just go and buy a new one if you still want to support Apple. So you think Apple should be required by law to have some sort of depot website where you could, say, by each any every individual part of a HomePod for self assembly like LEGO? Another load of BS, go back to PC land, you never owned a Mac in your own damn life and just spouting to hear yourself talk. They wanted a screen replacement and in my opinion, they should be able to get that done by Apple, no matter how much they charge. I know they don't have do to it, because it's in their terms of service, but it shouldn't be, it's not the right thing to do. This Apple defense you wrote up, is pointless in my opinion. Always had Appleinsider in high regards, but how you tried to discredit them was not OK, lost quite a bit of points by me. Why is explaining how the service model works and the facts that make this repair not worth it to “not OK”? 1) Read the sentence again. That is exactly what the video showed. We made no comment on if it was a re-enaction. 2) Watch the video again. Sure wasn't serious! 3) I know what condition the iMac Pro was brought in, as they said themselves how they brought it in -- disassembled with a smashed screen. 4) They said that they're technicians. If they didn't know, then they aren't good technicians, so which is more likely? I didn't say that they had done it before. 5) Their analogy was crashing into a lamp post. It's a garbage analogy, because it didn't magically break by accident while they were in the course of normal use. They took it apart, willingly, to make a video about it and make money on YouTube and failed to re-assemble it without damage. This isn't a news article. It is an editorial, with opinions. If it's an editorial, then mark it as one. On to the analogy thing, the point with that is that Apple doesn't even have the support infastructure to repair iMac Pros out yet. If you want a better one, immagine they released the iPhone X without being able to repair it and tried to hide it. Don't go around saying people are bad technicians. Especially with as strong a viewerbase as Linus. Just look at their server infastructure or custom PCs and tell me they are bad technicians. "Oh but I didn't say they were bad technicians". No but you threw it out there that they may be (Which they aern't) and it sticks to the reader as though you did. Also lets not forget on the whole issue he was going to PAY for the repair. He didn't expect them to just hand him or his staff the parts like you imply he does. Now you can be a Mac/Apple fan without being a fanboy, I've used Final Cut/Macs for years now, but I'm by no means a fanboy. But when you go out of your way to decieve readers into believing someone else is ignorant who complains about a crappy thing Apple does, that's just fanboying and bad journalism. I think I'm coming around to seanismorris' thinking¡ Having smaller elements built-into a larger, more complex device is a huge waste. We're moving backwards, people! That's why I now believe that every transitor should be socketed and removable, just like in the good old days of computing. It's what the real pros did. Big Microchip wants you to buy an entire processor with billions of transistors already built into a chip with how some know-nothings thought it should be designed. Let me arrange and then program those transistors how I see fit. Every single parts should have a screw linked to it, be socketable and a 10000 steps LEGO LIKE manual how how to build your own computer from scratch, and they should put the correct screwdriver inside the case just in case you don't own one... all capacitors should be able to be refiled or should be able to be dissassembled, saving 5 cent to replace them. Apple will send in a team of computer engineers post-grads and a mobile lab to help you in your plight and then slap you around so you don't do that idiot thing again. Of course, your laptop will now weight 15 pounds so you'll need a jetpack to carry it, all courtesy of Apple. 1) It is labeled as an editorial. 2) Apple does have the infrastructure to repair the iMac Pro, as discussed in this article. 3) I didn't say they were bad technicians. I didn't even imply it. 4) I did say in the article that it was good that he was going to pay for it. He (or his staff) did, very specifically, hand the parts over to the Apple Store. 5) He's entitled to complain. I'm entitled to point out salient points that are easy to find out, but he neglected to mention. They present it as a simple cracked screen in the video, which is very misleading. If you watch the whole thing they very clearly state they need a new screen, motherboard, and PSU. In the chat log with Apple, they say that the PSU is still providing power to the board (MOBO?) and that they need a new screen at a minimum. No talk of needing a new MOBO, and not certain on needing a new PSU. No link to the video in question? We needed to acknowledge due to how popular the video has become, we do not, however, need to drive traffic. Nope, that's not the point. They do have the parts. Just because you don't like what i said, doesn't make it BS. It was the truth and a very good point that Linus originally made about the product. Attacking someones credentials as opposed to the content of what was said is a terribly weak way to try and put forth an argument. I assume you have never made a single comment about any product on earth that you have never owned, that seems just a little unlikely. Fly by night criticism about Apple are a dime a dozen around here and you have the hallmark of someone who doesn't know what he's talking about and yeah, seams I got that right huh. And no, I don't talk crap about things I don't know anything about; spin that straw man somewhere else. You are correct. It's not BS because he didn't like you said, it's BS because you're claiming that including a display in a product is "shady and definitely Anti-Consumer." Not liking what you said is a result of you writing a bunch of BS. Still has nothing to do with what i actually said. If i didn't know what i was talking about you'd refute what i said. Again, attacking the person and not the statement is a really weak argument. The crux of the issue is that Apple does not sell individual parts for people to do it themselves, instead requiring people to go to "authorized technicians". But if those authorized technicians refuse to fix it, you're SOL on a product you own. Regardless of whether or not he is "ill informed", that issue still remains.